McGrath will have a performance installation on the first floor of the Library behind the staircase between November 8th and November 14th, on view during library hours. She will also give an artist talk at the Halifax Central Library for the 12th of November at 7pm at the Library. Hannah Levin McGrath works largely through improvisation. She has recently found her way into performance art, an avenue where she is able to synthesize her interests and find new means to communicate. Through improvisational performance, she responds to her immediate environment, fluctuating between arranging/rearranging objects, writing/talking/making sounds, and intuitive dancing. Adjusting is the third installment of a performance installation of the same title. Recently graduated with an Interdisciplinary Fine Arts degree from NSCAD University, Hannah Levin McGrath will continue thinking and playing. IOTA: Can you describe the difference between being a performer, and being a performing artist? HLM: The ‘artist’ is the important distinguishing word. I think most artists strive for feelings of agency, look for truths and have trust in the imagination. Performing can allude to something being shown or displayed, and can have an artificial quality. Within a fine arts context, performance is able to stay open and there is space to play with questions like these. 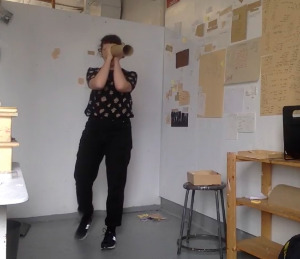 IOTA: In your NSCAD graduation show titled “Adjusting” (June 2015), you asked for participation from the gallery audience in a durational performance through the week of the exhibition. The installation was made of paper, sound, video and other materials, and your audience was asked to build and add to the installation. Can you talk about audience participation in your artistic process? HLM: During that week-long exhibition, the audience could draw or write if they wanted to. They could move things if they wanted. I would at times ask someone to write something, or hand them a pen, but mostly, we just ended up having conversations, or they watched as I continued going about my own shifting of the exhibition space. Having given myself no strict limitations except to be present and follow the signals as they arose (through psychological, emotional, external/circumstantial cues), I was also able to constantly reflect on my intuitive decisions to move and think through the space. Whenever there was somebody, or multiple people in the space, I responded to their presence in whatever way fit that moment. People give me energy, especially when they are enthusiastic and curious and I think that people often appreciate when their presence is recognized in some way. Even if that is to be left alone, but still subtly acknowledged. I produced quite a bit of writing and footage from that week and am planning on putting it together for the internet sometime soon. IOTA: Can you talk about your first group exhibition out of school at the Eye Level Gallery’s Y-Level exhibition (installed in Parklane Mall) title“Wooden Fruit” (Aug-Sept. 2015), and if you are already seeing revelations about the art world, post school. HLM: “Wooden Fruit” was such a fruitful (yikes! unintentional pun that I guess I will keep in) experience for me. The curator, Manet Dykes, was so dedicated to each of the artists and our practices. It was a super collaborative approach for a group show as we met many times before the opening, working through ideas with one another. In terms of revelations about the art world, or in terms of this specific experience of a post school art exhibit, it is still very soon after the show so I do not think I have the insight that I might once I let a little more time pass. What I will try to articulate is that though I respect and love what many artists strive for, I believe that we are often misunderstood and can be viewed through a negative lens that either alienates us from that which is outside of the art realm, or from people who are not familiar with the language and values we are working within. This often happens when someone feels like a work is not for them, and can’t find an entry point. Specifically, art that relies on a knowledge of art history. I felt very conflicted for the majority of the installation because there was the potential to interact with so many people who wouldn’t normally seek out an art gallery, yet there still seemed to be a huge barrier between the exhibit and the public who strolled through the mall in which the pop-up show was in. The visitors of the mall were mostly there for purposes other than to be stimulated or challenged by the art we were showing, and perhaps because of the overall minimalist, process-based aesthetic, a very different look from the rest of the mall, we didn’t attract as many passer-bys as I hoped we would. However, defamiliarization can be a potentially transformative experience, so maybe the show had a more subtle effect on the people that I thought were just plain annoyed or disinterested. The aesthetic was also refreshing for a lot of the visitors, and I think it was a really successful first group show for all of us, perhaps especially with the added tensions and confrontations within the mall. I am looking forward to my performance and accompanying installation for the night of the Creative Nova Scotia Arts Awards Gala, but especially the carrying over through the following week in the Halifax Central Library, a public space where people are keen to discover. IOTA: Who are some of your influences? HLM: I have always loved improvisational jazz musicians, soul and R&B musicians. Duke Ellignton, Stevie Wonder, Nina Simone. Whatever comes from an honest place and has a message with integrity. Music that provokes and moves. People who are guided by curiosity. John Cage. Artists looking to break the spells and open consciousness. The Fluxus artists and their approaches. Aki Sasamoto was introduced to me this year as a performance artist who has a background in dance but incorporates spoken word and play with sculptural materials to aid with the communication of her visions. Seeing her work showed me a contemporary example of a way to fuse forms. Pina Bausch was one of the first mainstream choreographers that I was just totally captivated by, her dedication to her dancers as not simply bodies to make nice lines and shapes with, but who are human beings who move from their feelings and inner intellectual worlds. Yvonne Rainer and Simone Forti and their stripping away of technique to reveal the beauty in everyday movements. Writers and poets. Kahlil Gibran’s “The Prophet” continues to resonate. Critical Theorists such as bell hooks (her writing on intersectionality and love), Judith Butler (gender performativity, the psychic life of power), Rosi Braidotti (her feminist writing on nomadic subjects and applying a cartographic approach to understanding contexts) Deleuze and Guitarri’s notion of the Rhizome. I’m influenced by the weather, following pulls, feeling suspension, release and tensions. I’m influenced greatly by my parents. Kira Duabe, Elizabeth Johnson, Elsa Pete, Daltry Rose, Nicolas Dourado, and all of the many wonderful people I am surrounded by. I’m influenced by most people I come into contact with. It is important to surround yourself with good influences because what is around you will influence you even if you would prefer it not to. IOTA: What does the word improvisation mean to you as an artist? HLM: I have spent the most time with improvisation in music. So in that context, it means listening and committing to the present, that is, being ready to respond to whatever sounds are a part of the piece. Carrying this through into improvised performance art, I think being open to the multiplicity of stimuli that is constantly presenting itself to you. It really means trusting yourself. Your experiences, the time you have committed to research and processes of self-reflection, critical unpacking and historical grounding. Since improvisation requires such fast decision making, trusting your intuition is essential. That which is beyond one’s rational limits in order to genuinely receive and respond. Receive whatever is directed at me, whether that is noticing fear, which is where self-knowledge is crucial…being able to distinguish between disagreement with something external or whether there is an unrealized inner conflict that needs more focus; is all so hard to place and understand. Which is part of what I like so much about it. HLM: Who knows! Of course I will keep working. There are so many intelligent and creative people in my life, I am excited to see what projects arise from the connections I’ve made and am continuously making. Right now I am having a lot of fun with music projects. I play in a few bands and participate regularly in the Sound Club at the Khyber Center for the Arts. I am also practicing drums regularly at Radstorm, a collectively run, diy, all ages venue and Jam Space / Screen Printing Studio. I am heading back to Toronto in the near future and looking forward to hanging out lots with my mom.